Try this beautiful Agua de Jamaica (Hibiscus Lime Cooler) with Coconut Water at brunch. This agua fresca is based on the Mexican Agua de Jamaica, but made as a cold brew and with coconut water. It's tangy, earthy, sweet and refreshing! In a large jug, mix together the dried hibiscus flowers and cold water. Cover and refrigerate overnight, at least 12 hours. When ready, strain out the dried hibiscus flowers. Mix in the coconut water. Gently squeeze and add in half the lime wedges into the jug. Dissolve 4 tablespoons sugar in a little hot water to make a simple syrup. Mix in the simple syrup. Place the remaining lime wedges in each individual cup. Serve with ice. 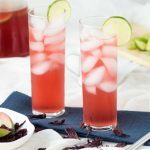 Get this recipe for Cold Brew Agua de Jamaica (Hibiscus Lime Cooler) with Coconut Water at https://www.theworktop.com/breakfast-brunch-recipes/hibiscus-lime-cooler-coconut-water/.